Affordable 4K Ultra HD LED TVs from electronics giant Sony will soon be available for consumers on a tight budget, the company announced yesterday. An 84-inch 4K TV from the electronics manufacturer would normally cost as much as $25,000.00. To make room for consumers who are looking for friendlier prices, however, the company will make available a 55-inch XBR-55X900A and 65-inch XBR-65X900A 4K Ultra HD LED TVs, respectively. The two models will be available at a cost of $4,999 and $6,999 and the company will accept orders starting April 21. Prior to these announcements regarding its selling price, the new sets were unveiled at the Consumer Electronics Show last January. For those who want to have a closer look at the new sets, in-store demonstrations are now also provided at Sony stores in the following locations: New York, Las Vegas, Houston; as well as the cities of Palo Alto, Century City, and Costa Mesa in California. The 4K TV features a number of pixels that is four times higher than that of a regular HD TV, that is 3,840×2,160. 4K is also known as Ultra High Definition. Before finding its way in home TV, it has been widely used in cinemas. In introducing 4J to the market, Sony hopes to catalyze a move in the industry towards 4K video, which is needed to generate an upgrade cycle similar to that one when consumers replaced their old CRT TVs with new flat panel models. The challenge remains, however, that users don’t have at their disposal as yet video content that are shot in 4K. Apart from that, observers have also noted that 4k resolution is also too high to perceive unless otherwise users will sit very close to the screen. 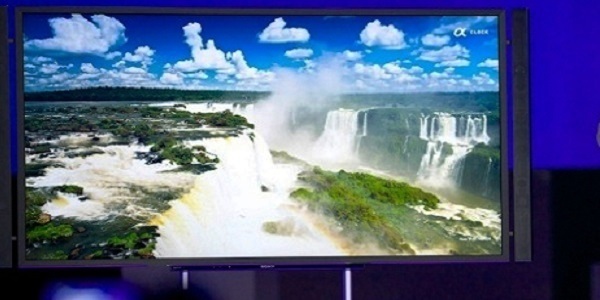 According to Sony’s Electronics Home Division Vice President Mike Lucas, however, the new sets are designed to “bring the enhanced viewing experience of 4K TV to a whole new audience”, adding further in a statement that the new models are scheduled to arrive at homes just in time for summer. To enhance the users’ experience from these new sets, Sony also announced the availability of FMP-X1 4K Media Player, which will be available for purchase this coming summer. The player comes with a bundle of 10 feature films and video shorts in actual 4K resolution. The player is priced at $699 and includes the following films as a bundle: “Bad Teacher”, “Battle: Los Angeles”, “The Bridge on the River Kwai”, “The Karate Kid” (2010), “Salt”, “Taxi Driver”, “That’s My Boy”, “The Amazing Spider-Man”, “The Other Guys”, and “Total Recall” (2012).